If you're not a morning person and simply can't face eating anything before you've been up and about for a few hours then a simple smoothie might be the answer. You can pack it full of fresh fruit and then you know you've had a decent start to the day. In fact shakes and smoothies can be enjoyed any time of the day and they're a great way to get an instant health boost and cram a couple of fruit portions into one glass. You don't need any special equipment to create delicious shakes but you'll definitely need a blender. A jug blender is great but a small hand-held blender will work just as well and they're pretty cheap to purchase these days. If you want to make fresh fruit and vegetable juices then you'll need a juicer but it's best to start off with some simple smoothies and see if you end up making them regularly before you invest in any expensive equipment. As with soups, the recipes and ideas for shakes and smoothies are virtually endless and, as you get more confident, you'll also get more creative. This is a quick and easy recipe that's also very filling, so perfect for breakfast. 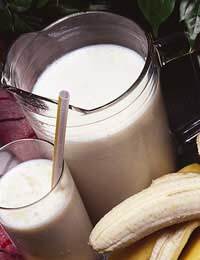 Chop 1 banana and put it in a blender. Add 300ml milk and 1 tbsp runny honey. Blend until smooth and transfer to a glass. Chop 100g fresh strawberries and place in a blender with 200ml milk and 100ml strawberry yogurt. Blend until smooth. Cut 2 ripe peaches in half and remove the stones and skin. Cut into small chunks and place in a blender with 150ml orange juice. Blend until smooth. Put 1 handful each of blueberries, raspberries and strawberries in a blender. Add 100ml natural yogurt, a dash of milk and 1 tbsp of runny honey. Blend until smooth. Not quite a healthy option but it's nice to treat yourself to something decadent on a hot, summer's day. Put 200ml chocolate ice cream and 100ml milk into a blender. Blend until smooth, pour into a large glass and sprinkle over half a Cadbury's Flake. Put a handful of blackberries, 1 small apple (peeled and chopped) and 100ml orange juice into a blender. Blend until smooth. Try your own creations using any variety of fresh fruit combined with flavoured or natural yogurt, and fruit juices. You might discover some really delicious new recipes!